2016 is a special year for Shen Yun Performing Arts. It’s the premier Chinese cultural dance troupe’s 10th anniversary. To mark the anniversary, Shen Yun is providing theatre-goers a beautiful memento playbill, full of information about the company and detailed program notes explained in English with Chinese translations. New stops in the Western USA tour include Central Valley cities such as Bakersfield, Fresno, Sacramento, and San Jose. Shen Yun Performing Arts company began in 2006. According to legend, a group of Falun Gong practitioners using their professional skills offered theatre performances about the persecution. When Master Li saw how the fledgling troupe demonstrated great potential, both for conveying authentic Chinese culture in the performing arts, as well as providing opportunities to make a positive impact upon society, he decided to become involved. At that time, the Chinese Communist Party (CCP) persecuted Falun Gong practitioners throughout China. After 1999, practitioners were publicly denounced and many were sent to labor camps, where they often underwent torture, including live-organ harvesting. In one recent feature, “Shen Yun Heralds the Beginning of a New Era,” two sisters, Lynn Pentz and Rene Besold, recount their experience from attending this January in San Jose. Her words encapsulate my fourth Shen Yun events attendance at the January 17th performance in William Saroyan Theatre in Fresno. This performance was graced by the presence of Milen Nachev, who conducted the symphony orchestra in a grand performance at the Carnegie Hall last October. Shen Yun’s orchestra intensity and tempo is dramatically attuned with the choreography, stage events, the timbre of vocalists, and guest instrumentalists. All parts of the program intimately connect the audience with the sensation for appreciation. This year there are no less than 17 dazzling choreographed dances, from classical Chinese to ethnic folk dances. Careful incorporation of the discipline and training from ancient traditions are premier Shen Yun trademarks. Male dancers exhibit Chinese martial arts style movements, including turns, flips, and aerial acrobatics. Female dancers are clothed in exotic period costumes replete with head-dresses, scarves, fans, and even footwear. Shen Yun’s digital graphics are creative. “Lady of the Moon,” is digitally enhanced with the sensation of fairies descending and traveling back to the Moon. “Monkey King and the Dragon Palace” employs scene changes from the mountains to an imperial palace. Spiritual Falun Dafa practitioners will recognize that the Buddhist Dafa principles of benevolence, truthfulness, and forbearance are made accessible at performances. Admittedly, I once found the worldly vs spiritual benefit confusing because of Master’s involvement as a leader of Shen Yun. Knowledgeable practitioners understand better that the spiritual message is not secondary to the commercial sales component. The power and impact of each performance is such that the quality and artistry exceed ordinary people’s expectations. Nonpractitioners of high social caliber praise the show, their outlooks on life perhaps transformed, and their karma even dissolved or lessened. Prior to attending the show, many ordinary people knew nothing about Falun Dafa, except that it was a persecuted religion. After the performance, their understanding on the cause of the persecution is vastly different. They are accepting of Buddhism, even if they have never visited the Far East and understand little about these cultures. However often devoted practitioners, such as myself, can only afford the top tier seats. Having sat before in the bottom pricier sections, I can testify that wherever you sit in the theatre, the nature of the atmosphere of the performance is such that the best quality is often experienced among the Dafa practitioners at the top due to spiritual resonance. 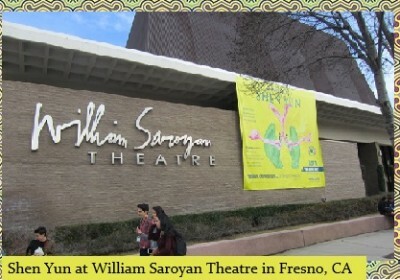 In fact, the William Saroyan Theatre in Fresno has nice egalitarian layout. Due to the number of side doors adjacent to each row, it allows for maximal unobstructed views. When they are present, staff Falun Dafa practitioners help ensure that the quality of beauty and goodness that permeates a Shen Yun performance really can have the effect of saving sentient beings and stirring the soul. Accordingly there are several dramatic skits highlighting themes such as salvation and renewal, or the call to cultivate virtue and self-refinement in spite of historical religious persecutions. For instance, “Monks and the Red Guards” is a dance story recounting destructions that took place during the Cultural Revolution; “Path of Hope” depicts the persecution of a family of practitioners by police; “Hope for the Future” is an apocalyptic story envisioning a new era. There are also original songs, instrumental music, and other beautiful set pieces which portend hope, faith, and appreciation of China’s long history. As Peter, a Shen Yun manager, tells it, Shen Yun’s goal is to help protect and promote classical Chinese culture and values, so more people can appreciate what China’s traditions are. Apparently then, there are many hidden classical treasures awaiting rediscovery.